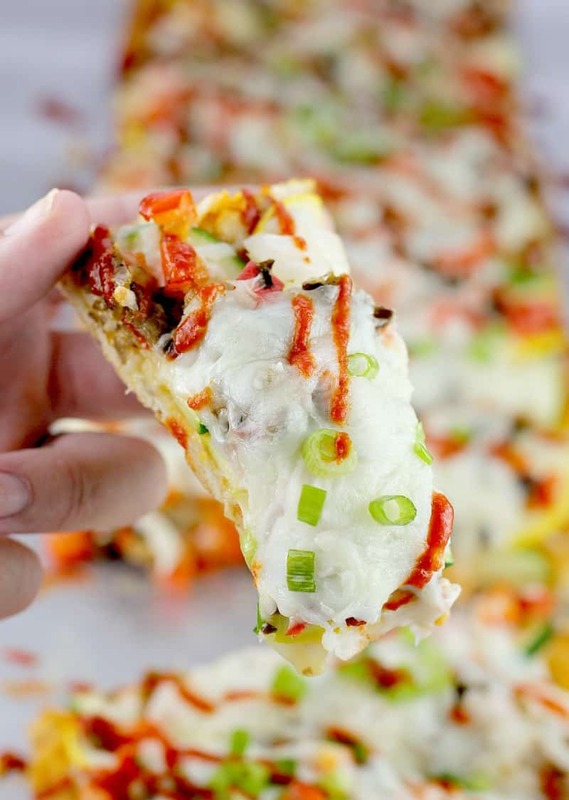 Crispy flatbread loaded with veggies and Thai flavor, this surprising Thai pizza will wow your crowd and keep you sane because it is so easy to make. 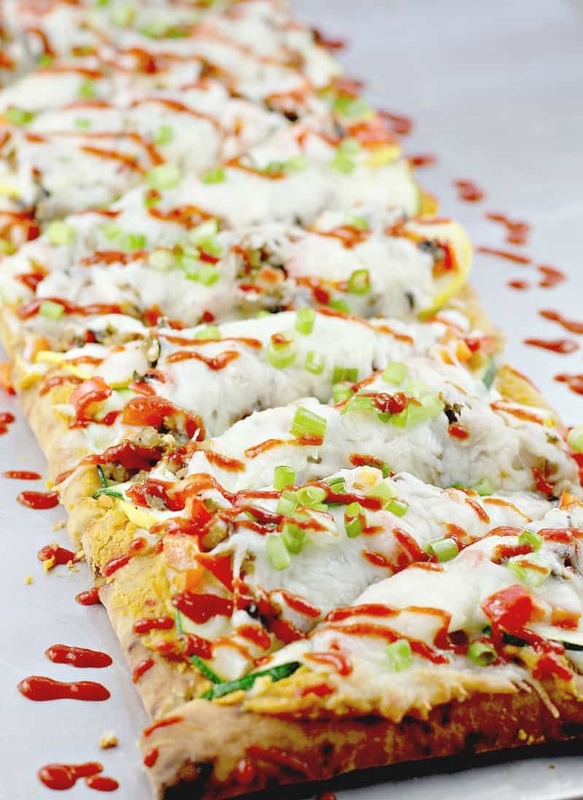 Vegetarian, light and pretty, Spicy Vegetable Thai Flatbread is full of flavor. I received samples of BLENDABELLA Portabella Mushroom Blends as an incentive to enter a recipe contest. I have received no other compensation. So here we are! 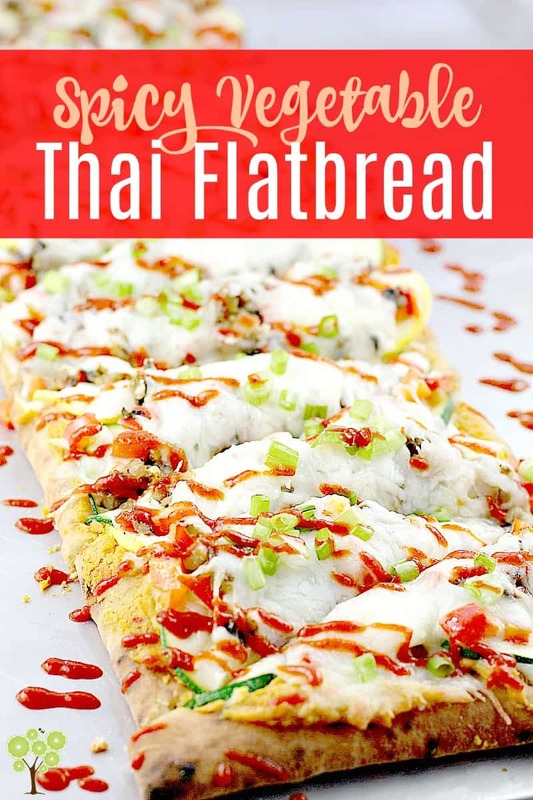 With a fantastic new Vegetable Thai Flatbread and fun vegetarian recipe. Crispy flatbread, Thai flavors, succulent mushroom, zucchini, squash, AND in this recipe, we learn that hummus makes an excellent, exotic, gourmet pizza sauce. In all my pizza recipes and fun pizza creations, if there is ONE thing I have learned, it is that you can pretty much create anything you want and put it on a crispy crust with cheese. Huzzuh. And that is a small sampling. Clearly, I heart pizza. And I have had it in the back of my mind for a long time to make a new pizza and go the Thai route with it, and so here we are. What I did here is so fantastically easy, and the outcome was SURPRISING it was so good. I used an easy purchased crust (picked this up in the deli section of my grocery store), then brushed it with olive oil and put it to bake and crisp just a bit before adding everything else. Then, I layered red pepper hummus as my “sauce” (this was AWESOME, I will use this idea again). Then, I layered cheese, thinly sliced squash and zucchini, chopped red bell pepper and onion, BLENDABELLA Thai Portabella Mushroom Blend (available online), and a bunch more cheese. Once cooked and suh awesomme, I drizzled some spicy Sriracha sauce and sprinkled some fresh green onion and IT WAS SO GOOD. Really good. I LOVED the flavors and textures – the squash and zucchini especially. I sliced them thin so they would cook a bit and not be raw, but not too much to keep a bit of fresh bite. Yes this was perfect. The BLENDABELLA flavors, Sriracha, cheeeese. These were epic good WOW bites of flavor. So that’s it folks. 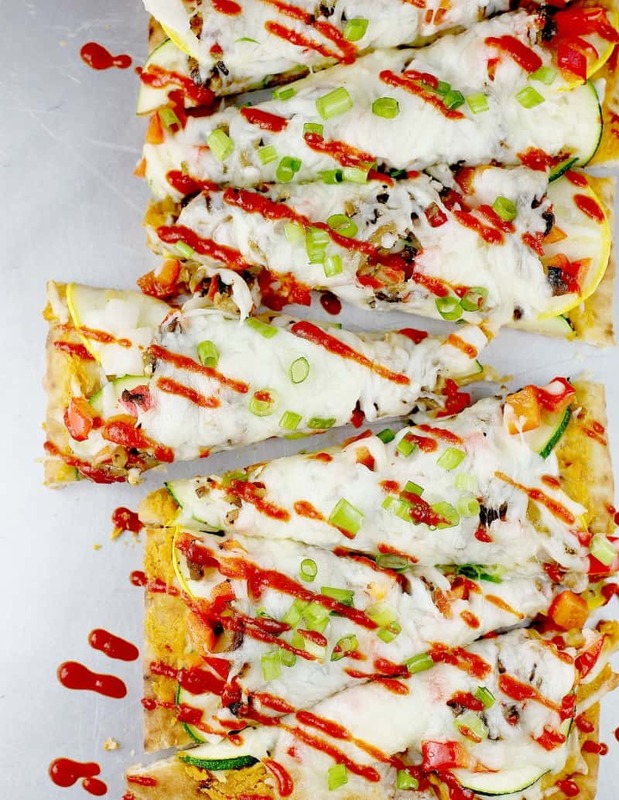 Crazy tasty, creative, fun Vegetable Thai Flatbread. If you have the slightest bit of adventure in you, or any love for Thai flavors, give this one a try. 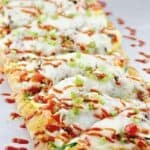 Crispy flatbread loaded with veggies and Thai flavor, this surprising Thai pizza will wow your crowd and keep you sane because it is so easy to make. Heat oven to 375F. Put the flatbread pizza crust on a bake sheet, brush with olive oil, then pre-bake 5 minutes. On the flatbread, spread the hummus. Layer 1/4 cup cheese. Layer the zucchini and squash, then another 1/4 cup cheese. Layer the onion, red bell pepper, BLENDABELLA Thai Portabella Mushroom Blend, and remaining cheese. Bake at 375F on the bake sheet for 5 minutes. Transfer flatbread directly to the oven rack and bake an additional 5 minutes until bread is toasty. Remove flatbread from the oven. Drizzle with Sriracha hot sauce and serve. Yields: 4 servings. 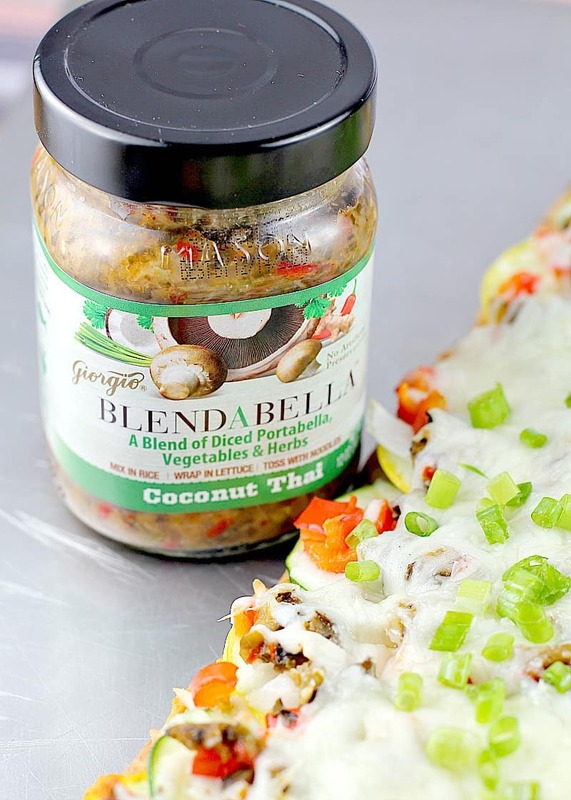 If you’d like to learn more about BLENDABELLA, check them out here or follow on Facebook, Twitter, Instagram, and Pinterest. 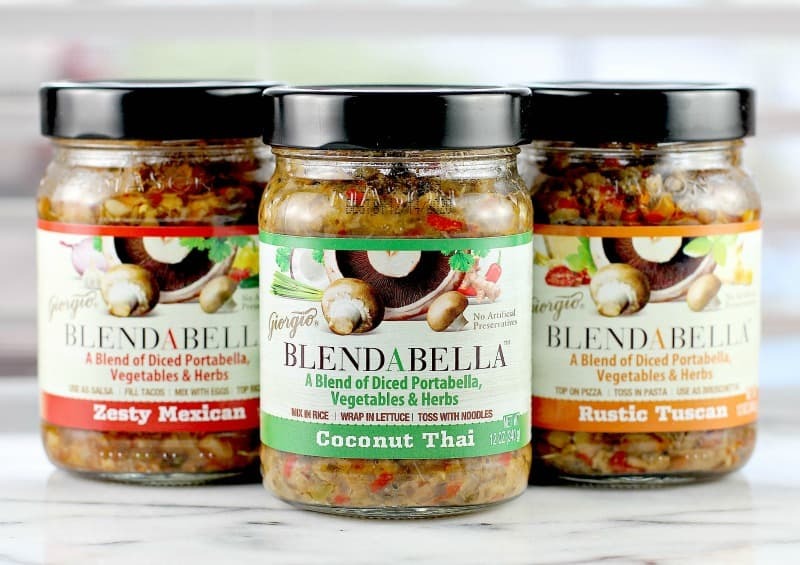 BLENDABELLA Mushroom Blends are available online.